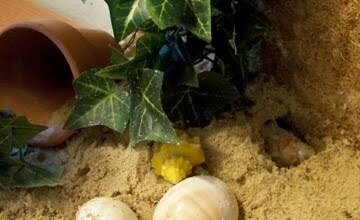 Have I told you about our Hermit Crab collection? It started out innocently enough. The Captain got the kids a pair of crabs for Christmas. Then in January, one died. This one, in fact. Rocky had survived his two-week warranty by exactly three days. 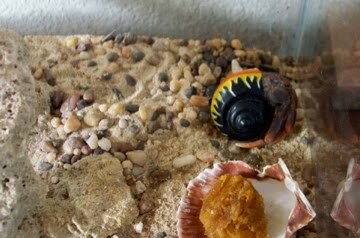 In the wake of mourning Rocky's loss, my friend Hollis offered to give us her remaining crab, Sunshine. She had had six at one time over the last five years, and the last hermit standing was lonely. So Sunshine came to live with us, along with lots of good crab habitat stuff, like a log, a climbing wall, a pot, and a food dish. 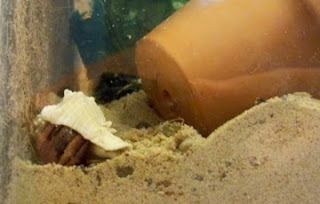 Popcorn had a friend again, and I got lots of information about how not to kill your hermit crab. This only encouraged the Captain. That weekend, he took the kids to the mall to add to the crab community. They came home with four more hermits. One of them is in a shell the size of a raquetball. Ugh. Like, I thought they were called hermits because they like to be alone. Why would one give that name to a community animal? But it turns out they like to be together. Despite their nocturnal ways, utterly boring demeanor, and their tendency to pinch the kids every time they get picked up, the hermits have been entertaining. 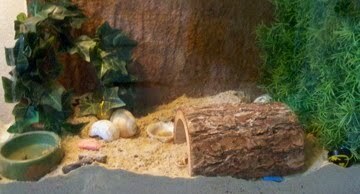 Every night they completely demolish their "crabitat", dozing over the log, the food dish, the ivy and anything else in their path. Once a week they get a bath, which is supposed to be fun for them but they spend the entire experience just trying to get out of it. And occasionally one will switch shells, which heightens the wonder of what will happen next? Somehow, even though the tank is in Boo's room, I find that I am the one making sure they get fed, are warm enough, have enough moisture in the air, and get regular baths. Even though I declared no interest in nurturing anything else until the baby is out of diapers. There is just no escaping it, the mom is the mom is the mom. Ah, back to the story. I get distracted so easily. Along about the beginning of April, we were three months into crabby care. Then Sunshine, our adoptee from a friend, disappeared. The last place we had seen Sunshine was at the top of the climbing wall, and now the lid was ajar. Could she have hopped out? We searched everywhere. For days. Then a week, then two. Finally I resigned myself to finding poor tiny Sunshine by the smell of her decaying body. Only I couldn't even find a smelly spot in Boo's room, or anywhere on the upper level. Rrr. And two weeks to the day after her disappearance, there she sat in the middle of the tank. Calm, cool and collected, like nothing ever happened. What??? At this point I need to mention that crabs, being crustaceans, occasionally molt. And Miss Hollis had mentioned that if she disappeared for a few days, not to go looking for her because crabs bury themselves in the sand when molting time comes. So apparently molting must give off a pheremone or something because while Sunshine was walkabout, three of the other five crabs disappeared too. This is something that is supposed to happen every 1-2 years, what's up with it all happening at once? I think they are having trouble though. Popcorn has been burying and unburying herself for two weeks now. And Sunshine, despite having been out of sight for two weeks, proceeded to finally shed her exoskeleton out on top of the sand two nights ago. I thought she had finally died and fallen out of her shell, until the next morning when I picked up the shell and there was a tiny crab still inside it! This really helped with my gross-out at seeing Bat Boy crunching up and eating what was left of Sunshine's claws & stuff. Ugh. A little too weird for me. So last night Boo and I were talking right before lights-out, reminiscing about the whole Sunshine incident, and sharing our relief that she's one tough nut. And so glad she didn't actually escape, because that would have been really bad. Just then, no joke, we heard a scratching from behind Boo's bed. Not in the direction of the crab tank. What??? We turned on the light and I looked for the source of the scratching sound. 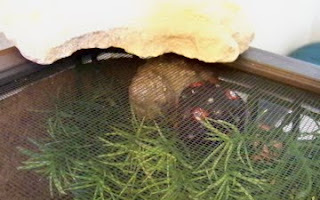 And what to my wondering eyes should appear, but Roly Poly, our #2 largest hermit. What on earth! Apparently all the time I was worrying about little Sunshine, we had another one on the loose! I placed him back in the tank, relieved to have the gang all back together, as I thought. Then this morning, at 6:05am, I was jolted from my slumber by Boo running into the room declaring, "Hey!" I hate when that word wakes me up, there's something especially alarming about it: "You'll never guess where I found Beach! She was downstairs, under a bowl, under your computer desk!" Yes, the minute I got over the paranoia about Sunshine's disappearance, those other crabs had actually gotten out. But as I was now expecting them to be buried, I hadn't even begun to search for them. And this tiny one had been walkabout long enough to get out of Boo's room, down the stairs, across the floor, and under a dish? I swear we have gremlins living in our house. Now that we officially have the whole gang back together, I have placed large rocks on top of the lid. I'm a little nervous about them getting out again, but very relieved to be able to see all six of them at one time. You might know that Roly and Bat Boy are now sitting at the top of the climbing wall. It's like Roly filled Bat Boy's head about all the amazing things he discovered on his walkabout, and said (in crabby language), "You should come with me!" I think we're going to contact Hollis this weekend about possibly purchasing her extra 75 gallon tank. Because community creatures or no, surely the hermits are trying to tell me they would like a bigger playground. Wow, did this make me laugh. You could almost say it's crabtastic! :) Fun to hear about your various adventures.